There is a bit of a long-running joke among the New York reporters on the MTA’s press distribution list. Despite Gov. Andrew Cuomo’s odd assertion last year that the MTA is not a state agency, whenever the authority has good news to announce, the press release comes with Cuomo’s stamp of approval. “Governor Cuomo announces new countdown clocks” or “Governor Cuomo announces bus upgrades” or “Governor Cuomo announces LIRR third track.” He never sends out the releases with fare hike information, service changes or other bad news. When it’s convenient, the MTA is his. Cuomo’s release even included a perfectly Cuomo quote about the new maps. “On every subway car, in every station, and throughout New York, installing these maps means that the Second Avenue Subway is finally here and will be open on time,” Governor Cuomo said. The W train’s return a few weeks ago certainly didn’t merit a press release from the Governor touting new maps. While I am amused by Cuomo’s press release tactics and it can come off as self-serving at times, there’s a larger lesson than the politics of gaining positive press. When Gov. Cuomo is involved in matters of transit and the MTA, in particular, good things happen and bad things are avoided. In other words, having a strong chief executive willing to take some ownership of transit investments is something New Yorkers fighting for better transit should encourage. On an unannounced stop at the 86th Street station a few months ago, Mr. Cuomo was angered to see no one was working on a problematic escalator, Melissa DeRosa, his chief of staff, said. He walked around shouting, “Who is working on the escalator?” until the person appeared, she added. Yet, it is undeniable that having a governor who cares can get projects through tough spots. As Fitzsimmons notes, and as I highlighted in the excerpt above, Cuomo’s involvement has been instrumental in getting this project wrapped by the end of 2016. He can push competing forces — a contractor with no incentive to finish, an MTA Capital Construction staff afraid of turning operations over to Transit — to work together for a tight deadline. So if Cuomo can turn results, the question then becomes how to focus him. How can activists get the Governor’s attention at the start when project scope and priorities are formed? How can transit experts get Cuomo’s ear so he latches onto the right projects at the right time? These aren’t just idle questions; they are important concerns that will affect the future of New York City for years and decades to come. With him projects can survive and perhaps thrive; without him, things seem to linger. Yet, his original ideas often seem frustratingly short-sighted and small in scope and impact. It is the great Cuomo conundrum and one that must be reconciled for future success. Your observations are right on spot. While I do not expect Cuomo or any other governor to be micromanaging transit projects all the time it is quite clear that projects in NYC area can benefit greatly from high level involvement. I doubt he will get as involved with phase 2 as he is now with the wrapping up of phase 1. He will not be around for the ribbon cutting, but hopefully he will continue pushing for other transit items such as Metro-North Penn Station access with its four stations in the Bronx and a revamp of Penn Station. The Gateway tunnels and the LIRR improvements also have their merits. Let’s give credit where credit is due: Cuomo is getting phase 1 wrapped up even if it means daytime only service for some period of time. Ditto. I hope he truly gets on board with these other projects and does not just slap something together for a ribbon-cutting. EO, I hope that your hopeful optimism is realized, but I doubt it. It seems that Cuomo is not planning for 10 years from now, he can’t see past the next election. As I believe was mentioned on this site, he hasn’t even properly funded phase 2, has he? And that’s for a tunnel that, decades ago, was 40% completed. I imagine that in the world of public works construction there are a few top executives that are known to be the best. Would it make sense to find out who those persons are, and seek to hire one of them to run the MTA construction projects. I’m thinking of a bloody minded Moses who gets things done. Such a person should be an intelligent bruiser, should be given a great degree of autonomy, and should be listened to when he or she recommends changes in law and practice where appropriate. Without some such leadership – we will never see a true Second Avenue Subway, or any of the other worthy projects spoken of. You would think that this would attract bipartisan support, since without some such leadership being implemented for the first time, you’ll never get the new and maintenance construction that you need to keep this region alive. That sounds great, especially when we are talking about long-awaited mass transit projects like the 2nd Ave. Subway. But… What happens when that person wants to build projects that “you”/”we”/”one of us” disagrees with? That’s sort of the conundrum with Moses, no? He was able to get an unprecedented amount of development done, but what sort of, and at whose, expense did it come? 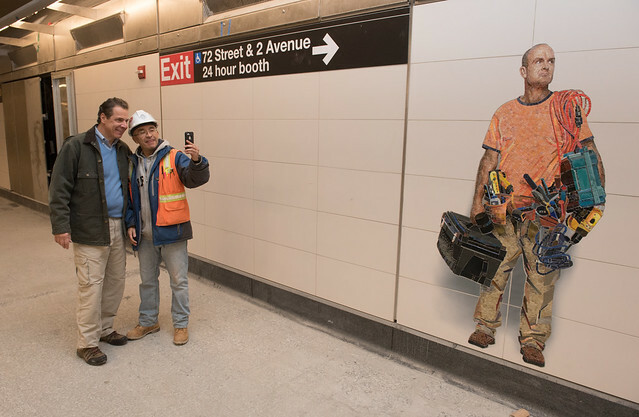 It’s certainly great that the Second Avenue Subway (Phase I) is finally opening. However, the Governor, as chief executive with a myriad of responsibilities, needs to be a leader by appointing effective people, that is, delegate authority, to manage projects. One of the problem is that when construction is hot, as it is now, construction companies will win public bids and then not perform, since it’s easy to screw the public. They’ll use their resources for the private developers, who can not use them later if they don’t get projects done now. The stall agencies such as the MTA. Why are stations the weak link? Because its the same workers that also build buildings. How about this for a goal. Prepare to bid Phase II ASAP! And get the thing built at a big discount — in the next recession. Which, from a construction point of view, may be coming soon. That’s when construction workers and companies will need the work. Phase 1 construction, at least the first part of, was well underway during the last recession. The groundbreaking was way back in April 2007. Crazy to think it took almost ten years to build. I’m sure there will be a recession at some point during the next ten years, when they’ll be (hopefully) building Phase 2. They rebuilt a mile of the #1 line in less than a year after 9/11. Yes the hole was already there, after it was cleared of debris. But how much of that decade of construction was digging the hole? And how much was “planning” and NIMBY litigation? They didn’t rebuild the 1 line…They just cleaned it up by demolishing the old Cortlandt Street station, and fixed up a bunch of steel beams and columns that got bent/crushed. In fact they are still fixing that line right now, as Cortlandt Street is still being working on as we speak. The MTA seems to be far more effective and able to work within a deadline when it involves having to take an existing part of the system out of service for urgent repair. People are used to having a service, and want it back a.s.a.p. if it’s taken away. The MTA was able to rehabilitate the Montague St. ahead of schedule. I imagine they’ll do the same for the Canarsie tubes. But when it comes to building something new, fuhgettaboutit. Are we dealing with two totally different sets of MTA engineers and construction crews? How is it they had the nerve to ask for “another year or two” to finish 2nd Avenue, and yet the Governor was able to hold their feet to the fire to make it happen? This is exactly right. The incentives are all wrong, and I don’t know the solution, but other places must be better at this. It’s great that his involvement was able to get this thing done on time. But it probably also meant opening up the checkbook at paying for 24/7 overtime for months to get this ready, because contractors aren’t going to work harder for free. They whole system for capital construction in this city needs to be fixed, and that’s really what Cuomo can help do. But nope. FWIW, Ben, I live right around the corner form the 86th St stop. I can take some update pics of the area if you’d like, they’re definitely repaving the 2nd ave stretches near the set aside fenced-off areas that used to be there on the east side. Tim: I’d love the pics. Send them my way. SecondAveSagas (a) gmail works since the contact form can’t handle attachments. I don’t agree that this was done on time. I think that the deadline was monkeyed with more than once? And don’t other very major US cities have a much better record at controlling costs and doing things to a schedule? I am thinking about Chicago? NO city in the US needs $2 billion to build a single mile of tracks like NYC does. Chicago’s corruption is just as famous as NYC’s is, but just to name two examples, both the Washington Metro and BART have been able to build significantly longer lines recently for less money. I can’t speak to the BART example, but the Silver Line is entirely elevated, which is much, much cheaper than digging a tunnel. And it was elevated through suburban northern Virginia, which is an entirely different animal than the Upper East Side. Are the MTA’s capital construction costs too high? Yes. But the comparison with the Silver Line isn’t apt. I wonder if it’s possible to calculate costs in terms of cubic feet excavated That might provide better apples-to-apples comparisons of below grade construction throughout the world. I still think New York would break records and not in a good way! $2 billion per mile is basically way off the charts. Sure, Cuomo is doing great job at burning other people’s money. That money is their time, effort, banged elbows and office backstabbing, their commute to work, offshoring musical chairs and late nights fighting with code that breaks in 2 new ways once every old one is fixed. That’s tough job, shoveling three billion dollars into a hole. People say that Cuomo is at it for the press coverage, and he is certainly good at self-promotion, but it seems to be deeper than that. Real engagement when needed seems to be one of Cuomo’s great genuine strengths. He did it here in Buffalo with the giant 7 foot snowstorm that hit some of our suburbs a couple of years ago by coming to town for several days and literally directing the recovery effort himself. He directly managed the manhunt for the escapees from the Clinton Correctional Facility in the Adirondacks earlier this year. Getting the Second Avenue Subway open seems to be in the same vein. Taking an active nuts-and-bolts interest where needed is the sign of a good governor. I suspect that Phase 2 and maybe Phase 3 of the SAS will get built. One of the main things that kills construction is over regulation ( not to mention waste fraud and abuse). I suspect there will be a deal involving President Elect Trump and Chuck Schumer to fund this, upon condition that costs are controlled. It is important to note that the many of the big public works projects are coming to conclusion ( Olmstead Locks ( Ohio River) and NYC Water Tunnel # 3 for example). I happen to like what Governor Cuomo did with the Tappan Zee Bridge. It is getting completed on time and is cost effective and it is a model to follow. It can be debated if transit should have been funded instead ( but that is another issue). I know there are going to be naysayers but Schumer, Majority leader Mitch McConnell and Donald Trump are all Deal makers not bomb throwers. Remember it was McConnell who made sure Olmsted got funded. The deal will be $1 Trillion of projects and to help pay for it cutting those regulations. I think SAS is high on the agenda. Is there really a new tunnel for the new Q running separate from the NRW through the southeast corner of Central Park? Or is that just a graphical representation to make the map clearer?